Many people, especially scientists, believe that astrology is rubbish. I agree that some astrology is superstitious rubbish. However, it does not make sense to debunk astrology without knowing anything about it. Ignorance about a subject is not a good enough reason to reject it. Let's look at some of the objections raised by sceptics against astrology. One thing that confuses some people about astrology is that they think that astrology takes away their free will. This is untrue and Magi Astrologers see progressions and transits to be like weather reports. You are free to have a picnic in a hurricane, but you'll probably enjoy it more if the day is clear and sunny. Magi Astrology doesn't really use the signs of the Zodiac so there wouldn't be much point in me discussing Sun Signs since I don't use them in my work. This is why I chose Magi Astrology; it is accurate and reliable and most of all, consistent. The Magi Society uses tropical charts and the first point of Aries is calculated from the March Equinox. This changes slowly with the precession of the equinoxes so this argument is irrelevant to Magi Astrology since we take it into account when calculating charts. What it means is that the Aries we see in the chart does not correspond to the constellation Aries. The Zodiac is just a convenient way of dividing a circle into twelve, we also use divisions of five and seven. Asking "How it works" or "Why it works" Instead of "Does it work?" This the most common objection sceptics have against astrology. They ask why or how does it work. If we don't know how it works then it can't be true. What rubbish! That would be like saying you can't use your TV or mobile phone unless you know exactly how it works. There are many theories on how or why astrology works (here is my hypothesis on astrology), but perhaps we should be asking "does it work?". I've seen ample evidence of it working and have even produced a study of how astrology affects the yield of shiitake mushrooms. The time of birth is a common point of contention. When is a person born? When the umbilical cord is cut or when they take their first breath? I believe that the time of birth is when a baby first experiences the coldness of being outside of its mother. This may be different for different babies because different people (babies included) have different levels of physical awareness. It may take one baby a few seconds to realise that it is not in the warmth of the mother's body or that realisation may be immediate. Knowing the accurate time of birth is important, but not essential. It is very useful for timing transits and progressions of the faster moving bodies, and determining the positions of the Moon, Ascendant and Midheaven. These are important points in a person's charts, but it is not essential to know them. For astrologers that use houses it is essential to know the accurate time of birth. Magi Astrologers don't use houses and do not need the precise time of birth when analysing people's charts. Inaccurate timing of transits and progressions to and from the Sun and Earth/Moon complex can result if a noon chart is used and the actual time of birth is closer to midnight. The time of birth is a concern for research into astrology. Aspects involving the Ascendant and Midheaven may be incorrect if the time of birth is out by just a few minutes. This is another common one. Sceptics ask how two people who were born minutes or seconds apart can have different lives. Astrology doesn't force people to do anything. We all have the choice in how to live our lives. People may be born with the same gifts and talents (these are shown by the charts), but these are just potentials. We decide if and how we use our talents. Two people may be born with exactly the same potential, but end up having very different lives. This is a reflection of the choices they made. There are other considerations; for example a person's wedding chart and the wedding chart of their parents (if applicable) are also influential. Of course, two people may make different choices because they are influenced by different people, but we can use Combined Alignment Charts to investigate human relationships. The argument goes that since we know that the heliocentric model is correct then why do astrologers still use the geocentric one? In Magi Astrology we both the geocentric and heliocentric charts because they both work. Without the heliocentric chart we'd be missing half of the picture. When astronomers "demoted" Pluto from a planet to dwarf-planet, people wondered what ramifications this had on astrology since Pluto is an important planet to most astrologers. Just because some people decide to change a classification doesn't change the thing they are classifying. Let's look at a silly example; if some people decided that lions were plants, would that change what lion are? Would lions all over the planet suddenly turn green, stop eating meat and photosynthesize? Obviously not. The artist René Magritte created a painting called La Trahison des Images ("The Treachery of Images") - see Figure 1. 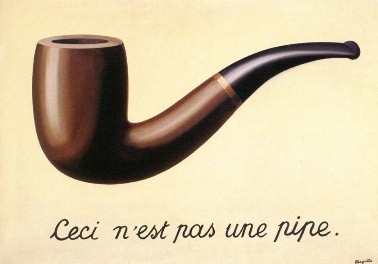 In it one can see a pipe and the words Ceci n'est pas une pipe ("This is not a pipe"). It is an image of a pipe, not the pipe itself. Similarly, we may call Pluto a planet or a vegetable, but this does not change its nature. Words are just symbols, not the objects they represent. In the same way our concepts about things are just thoughts that change and evolve. These concepts do not change the object.